Not always one can come across a 72-metre long tricolour, our revered national flag, when he wakes up and takes to the street. But, this is what people of Silchar witnessed on Wednesday when Hindu Chatra Sangh, an offshoot of the saffron brigade, the Bharatiya Janata Party (BJP), which just came into being six months back, took out a massive rally from Rangirkhari in Silchar. 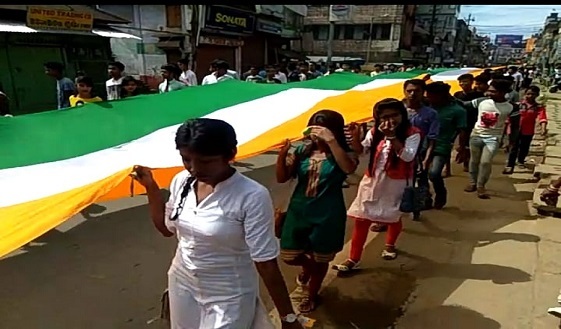 Students from all walks of life, joined hands in holding this 72-metre long national flag with pride and walked past various streets of Silchar. Chanting slogans of Vande Mataram and Bharat Mata ki Jai, these students marched past in unison even singing patriotic songs to commemorate this day. Under the banner of Tiranga rally, Hindu Chatra Sangh wanted to spread a message across all sections of society that this flag is our pride and honour and likewise we too should step up to see to it that our motherland basks in it. Hindu Chatra Sangh’s 72 metre long Tiranga rally caught the imagination of many passerby and residents who came out of their houses to see such a massive tricolour, a first of its kind in Silchar.